Planning a kids party is always fun, but with so many themes and entertainment to choose from, they can easily go over our budget if we are not careful. The good news is that you can have a great party if you know when and where you can get the best quality entertainment and amusements for your budget. If you are looking for party entertainment and games rental for your kids party on a budget, inflatables are the way to go, bounce houses, jumpers and moonwalks can keep your guests entertained for hours and they really won't break your piggy bank. 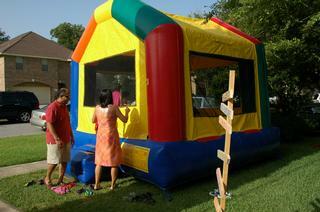 bounce houses come in many sizes, but a 13' x 13' is just perfect for backyards, garage and driveway set up. and for just a couple hundred dollars you can keep your inflatable for 4 to 6 hours, and if you're thinking about electricity costs, an inflatable blower spends about 14 cents an hour of electricity, that's even less than your regular leaf blower. At Extreme Climbing, we have many inflatable moonwalk options to fit your budget, from bounce houses to slides and obstacle courses. Check out or coupons section, because we always have specials. And give us a call 713 291 5579 we are here to help you make your event an unforgettable one.